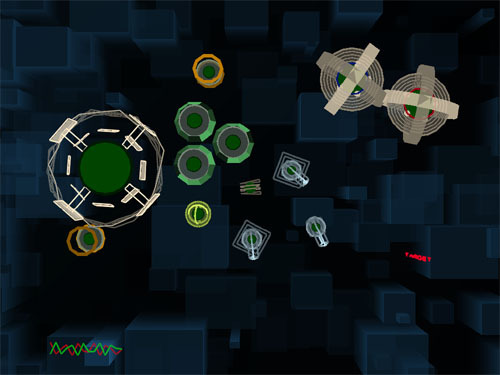 Gate 88 is an excellent mixture between RTS, Asteroids and a horizontal/vertical shooter. Sounds crazy? Well it is: Gate 88 combines traditional gameplay-elements and creates something new and unique out of it. Hard to learn, but really worth the time. Better begin with the tutorial, before you plunge into an exciting deathmatch multiplayer game. Gate 88 is not easy to learn, but very rewarding, once you get the hang of it. As soon as you destroyed your first enemy base notice the big smile of satisfaction on your face. The apparent complexity may be intimidating at the beginning. This may be one of the main reasons why Gate 88 until now did not get the attention it deserves. And it deserves all your attention because it really is a clean programmed game with ingenious gameplay, a property which is hardly found even amongst commercial releases. If you like to experience something new concerning the game play, you definitely should try this asteroids/ strategical/ action-title. The graphics are marvelous simple, but fit excellent in the game and really add to the unique atmosphere you will experience. Like the soundtrack does, which really is good, you should grab the copy with music.